On Thursday's "Good Morning America," noted Barack Obama sympathizer David Wright spun the senator's connection with William Ayers, a former member of the terrorist Weather Underground, as nothing more than a "neighbor" relationship. The ABC reporter, covering the highlights of Wednesday's Democratic debate, asserted that Obama faced questions "about a neighbor of his who was once a member of the violent Weather Underground." Of course, Obama's campaign has previously described the Ayers/Obama relationship as "friendly." Additionally, in 2001, Obama accepted a $200 donation from him and has also appeared jointly on academic panels with Ayers. During the debate, co-host George Stephanopoulos claimed, "An early organizing meeting for [Obama's] state senate campaign was held at his house." It would seem as though describing the relationship simply as neighborly is a minimization at best. Over on "The Early Show" on CBS, reporter Dean Reynolds also used the "neighbor" phrase, but the report went on to mention that Obama and Ayers also served on a board together. ABC also provided an example of onscreen graphic bias. 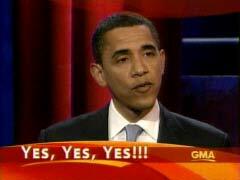 During the opening tease for the show, co-host Robin Roberts played a clip of Hillary Clinton answering a question as to whether Obama can win. She replied yes and repeated the answer twice. ABC's graphic proved to be far more excited: It read: "Yes, Yes, Yes!!!" Finally, while discussing the possibility of a Clinton/Obama or Obama/Clinton ticket, Wright hopefully observed, "The evening began with a question about the dream team." Clearly, the two Democrats running together is something "Good Morning America" would approve of. On March 6, co-host Diane Sawyer asked Democratic strategist James Carville about the subject. She cooed, "Let me go to the other dream solution." Mr. Wright, it should be pointed out, has repeatedly bashed Senator Clinton at the expense of Obama. In late February, he slammed a debate performance by the former first lady for having "an absolute clunker of an attack line." On April 1st, after noting that the Clinton campaign was low on cash, he snidely observed that included "a debt of $292,000 for health insurance premiums for her campaign staff. Ironic for a candidate promising health care for everyone." ABC GRAPHIC: Yes, Yes, Yes!!! GEORGE STEPHANOPOULOS: Can he win? SENATOR HILLARY CLINTON: Yes. Yes. Yes. ROBERTS: Hillary Clinton says Barack Obama can win, but she can too. And would, of course do a better job. We'll take you inside their showdown in Philadelphia with the critical Pennsylvania primary just days away now. ROBERTS: But we begin, of course, this morning with the race for '08 and last night's debate. David Wright is in Philadelphia this morning and has all the highlights for us. Good morning, David. What did we miss? DAVID WRIGHT: Well, Robin, this was a tough debate, especially for Barack Obama. As Hillary Clinton almost seemed to look past the Pennsylvania voters and addressed the super delegates, raising questions about Obama's electability. The evening began with a question about the dream team. Could Democrats possibly have them both? CHARLES GIBSON: Why not? Don't all speak at once. WRIGHT: The silence spoke volumes. 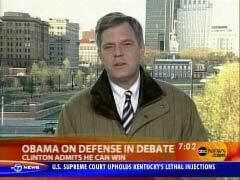 STEPHANOPOULOS: Do you think Senator Obama can do that? Can he win? CLINTON: Yes, yes, yes. Now, I think that I can do a better job. I mean, obviously, that's why I'm here. WRIGHT: Obama said the same about her, but collegiality had its limits, Obama found himself on the defensive, fending off criticism of his bitter remarks about small-town voters. SENATOR BARACK OBAMA: It's not the first time that I've made a statement that was mangled up. She said I'm elitist, out of touch, condescending. OBAMA: You just beat it to death. CLINTON: The Republicans who are pretty shrewd about what it takes to win, certainly did jump on the comments. WRIGHT: For the first time, Clinton apologized for repeatedly embellishing the danger of her 1996 trip to Bosnia. CLINTON: I'm very sorry that I said it. And I have said that, you know, it just didn't jive with what I've written about and knew to be the truth. WRIGHT: Obama faced questions not just about his controversial former pastor but also about a neighbor of his who was once a member of the violent Weather Underground. Bill Ayers is now a university professor and an Obama supporter. OBAMA: The notion of somehow as a consequence of me knowing somebody who engaged in detestable acts 40 years ago when I was eight years old, somehow reflects on me and my values, doesn't make much sense. WRIGHT: Now Clinton has already said yes to one more debate in North Carolina, but Obama has yet to agree to that. So this could have been the last debate between these two candidates, depending on the outcome here in Pennsylvania. Robin.